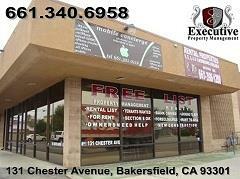 Executive Property Management is a professional property management/investment company located at 131 Chester Avenue, Bakersfield, CA 93301. Our goal is to provide unparalleled levels of service and integrity to quality landlords and tenants alike. We believe that treating tenants with the respect they deserve will result in better tenant retention and care of the property. By choosing Executive Property Management as your property managers you can be assured that the value of your property is being maximized by licensed professionals with years of local experience successfully managing properties just like yours. At Executive Property Management we have developed very specific and proven methods that we use to consistently produce great results for our clients. If you'd like more information about us or what we can do to help you make your investment a stress-free and rewarding experience, please call us at 661-340-6958.